A majority of the U.S. public now prefers alternatives over the death penalty as the best punishment for the crime of murder. More and more U.S. states are abandoning the death penalty as a broken system. 19 U.S. states plus the District of Columbia have abolished the death penalty, and six more states have not carried out an execution in 10 years or more. In 2014, only seven states carried out any executions at all. In May 2015 Nebraska became the most recent state to abolish the death penalty. Annual death sentences in the U.S. have dropped dramatically since the year 2000. 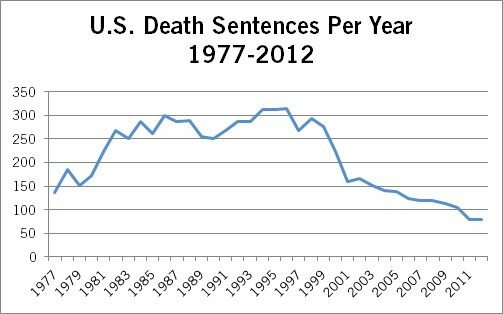 In the last eight years the number of death sentences has been lower than any time since reinstatement of the death penalty in 1976. In 2014 there were 72 death sentences, the lowest number on record since 1976. Executions have declined as well, from a high of 98 in 1999 to just 35 in 2014, the lowest in 20 years; there were 43 executions in 2011 and 2012 and 39 in 2013.
International Abolition: in 1977, just 16 countries had abolished the death penalty for all crimes. By 1988, 35 countries had done so and another 18 had abolished the death penalty for all but exceptional crimes like treason, and 27 more were considered abolitionist in practice because they had not carried out an execution in over 10 years. 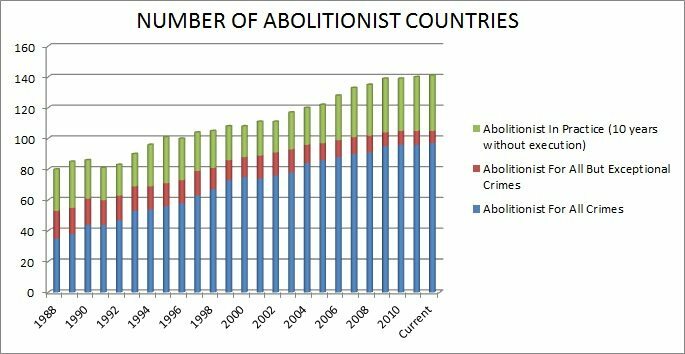 As of May 2013, 140 countries were abolitionist in law or practice.